INRAD model RX7300 allows you to add a receive-only antenna jack to the Icom IC-7300. This easy to install plug-in modification requires no soldering and is easily installed and easily reversible. The RX7300 can also be used for the insertion of accessory items into the receiver chain on the IC-7300 like receive-only bandpass filters, low noise preamps, etc. 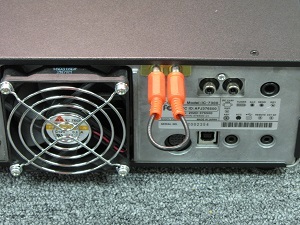 When installed, transceiver will transceive using the SO-239 antenna connector on transmit, and one RCA phono jack on the RX7300 on receive. To use transceiver in normal transceive operation, leave the RG-174 coax loop installed. This no-solder mod uses the jack space on the rear panel used for control of the external AH-4 tuner. Simply move this jack out of the way, and install RX7300 in its place.